Even if you're weary of urban fantasy, you'll find more to enjoy than you might expect from Londoner (and Doctor Who alum) Ben Aaronovitch's highly energized debut Rivers of London, which Del Rey has retitled Midnight Riot for its US release because I suppose it sounds more actiony. 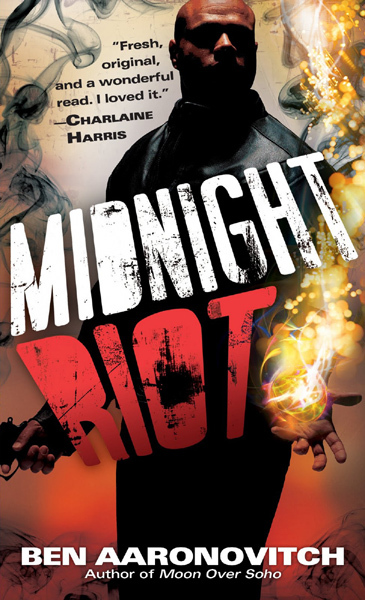 (Though there is indeed a midnight riot.) An old-school cop story tricked out with fantasy power-ups, it weaves London's vast history into a jarringly fast tale of magical street violence and chaos that may, in the end, be a bit too frenetic and overdone for its own good. Aaronovitch is just erupting with ideas in his debut, with the result that it indeed feels very much like a debut, all rough-hewn raw talent and excitement without much of the discipline of experience. But it's precisely these kinds of debuts that herald a considerable storyteller in the making. PC Peter Grant, the mixed-race son of a junkie jazzman, is a newbie constable in London's Metropolitan Police who finds himself inducted into a secret special branch of the Met upon observing, and speaking to, a ghost while patrolling a grisly crime scene early one freezing pre-dawn morning in Covent Garden. This special branch is run by avuncular DCI Thomas Nightingale, and Grant is his very first recruit. Nightingale, you see, is a wizard, and he is making it his business to police London's myriad supernatural crimes, of which the Covent Garden murder is an especially heinous one. And it's only the beginning of troubles to come. What immediately stands out is the way the established tropes of UF somehow feel refreshed when relocated outside the United States. 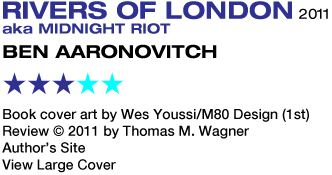 Aaronovitch's London is nothing like Butcher's Chicago. There's something about the character of the city that is so dense and textured and intimately bound to even its most ancient past that makes London so different from any American metropolis, and Aaronovitch's portrayal of the city is thick with every molecule of it. Rivers of London/Midnight Riot has a tremendous sense of place. The closest comparison I could come to the way Aaronovitch builds his story around London's history is nothing in contemporary UF, but rather Scott Mebus's woefully underappreciated young adult fable Gods of Manhattan. Nightingale trains Grant in basic spell-casting as well as the nature of the various spirits that inhabit the city. Aaronovitch thankfully knows how hackneyed such master/apprentice scenes are and doesn't belabor them. Mostly, he hurls Grant headlong into two magical crises. One is the murder, which is quickly turning into a series of murders, each more ghastly than the last. Considering the first involved a decapitation, that should tell you something. Some malevolent spirit is invading the minds and bodies of ordinary citizens and driving them to acts of savagery fatal even to the possessee. But what, or who, and why? After this book, I promise you'll never look at Punch and Judy the same way again. The second finds Grant trying to mediate a territorial dispute between Father Thames and Mother Thames, god and goddess of the great river. Here, the novel embraces London's extraordinary multiculturalism as a central motif. (In fact, that this is so important to the story is the reason why what Del Rey chose to do to the cover art for the US edition is so offensive. 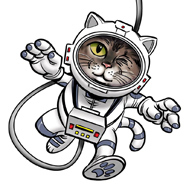 Check my Forum post for a word on that.) Just as Grant himself is one of the city's many mixed-race denizens, the river's spiritual character embodies the global nature of London's cultural landscape. Father Thames represents the English old guard, while Mother Thames is a Nigerian matriarch attended by a host of daughters — educated, willful, progressive — representing the city's many lesser rivers and tributaries (some of which no longer exist after centuries of building). Grant's on-the-job education in supernatural diplomacy brings him very close to Mama Thames' daughter Beverley Brook. Aaronovitch weaves these two disparate plot threads together in surprising and imaginative ways. And yet there's a point at which it starts to overstay its welcome. As the book nears its climax — and particularly in a lengthy section where Nightingale is out of the picture and Grant must carry the story on his own, for which he doesn't seem entirely ready — the more frenzied and harrowing the action becomes, the more it feels exhausting and excessive rather than thrilling. I am enormously impressed with the skill Aaronovitch shows in the construction of such a complex plot for his maiden effort. But not surprisingly, the results are uneven. (A more consistent tone might have helped. The opening chapter is so heavy on the humor that you get the idea what you're in for is a marriage of Jim Butcher and Douglas Adams. This evaporates as the plot thickens and the violence gets nasty.) Still, there is clear evidence that as he works the kinks out, as all new writers must, Aaronovitch's talents will very soon begin to match his riotous vision. Followed by Moon Over Soho.